This review is of the Boy’s New Year’s Box in 3T/4T. Kidbox includes a free bonus item in each box, and this month’s free item is a deck of cards. The colors and illustrations are cute! Always handy to have an extra pack of cards for family games. I like the style of this shirt. The fabric is very soft and the colors are great for the Winter season, too. Unfortunately, I forgot to update my sizing before this box was shipped and Gideon really needs 4T shirts. This is pretty snug. Whoops. 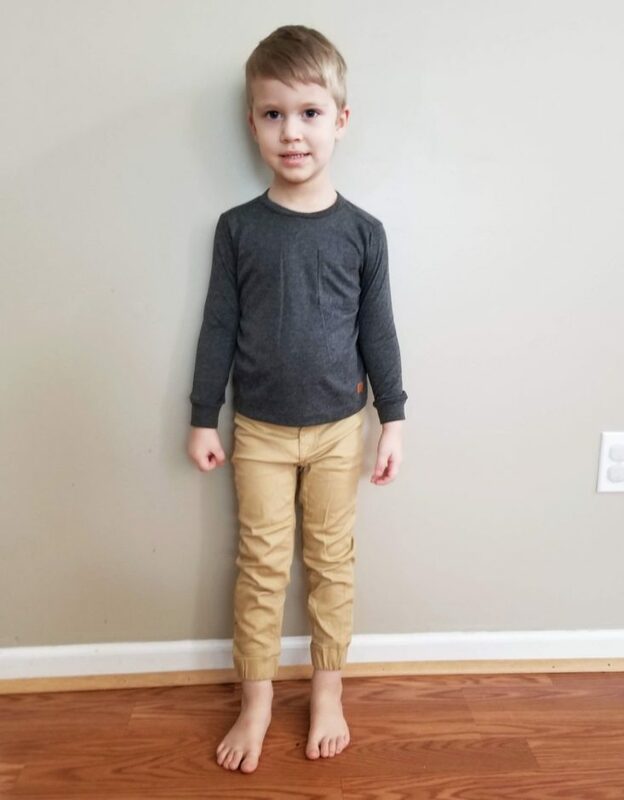 I thought a size 4 would be small on Gideon, but I am actually very pleased with how these fit him! Sizing can be tough to nail down for him on jeans/pants with buttons and no drawstrings. These are going to be great everyday jeans! We love all things science and space, and I love the print mixing. The back panel is completely stripes. I love the design of this shirt! The fit of these pants is absolutely fantastic everywhere except the waistband. I actually could barely even get the waistband buttoned! Normally, as tall as he is, if we find pants long enough for Gideon, they’re too big in the waist. These are very nice little chinos, aside from that issue. This little Henley is so cute! I love the denim-esque wash, and I love it with khakis for him. These items all came on one hanger as a 3-piece set. The tops fit Gideon well enough, but the pants are too small since everything in the set is 3T. Because Gideon needs a size up in pants than he does for shirts, sets that come together all the same size are not likely to work for him unless they’re sized up. I love the brand 7 For All Mankind. The items in this set are nicely made. The jacket is my favorite because it’s a nice step up from just a hoodie for a second layer. I wish the pants fit because they’re really cute and feature jogger-like elastic around the ankles. Verdict: This was a nice Kidbox for us! Besides the fit issues, which were not really their fault, it is probably the best-styled box and most in line with our taste than they’ve ever sent previously. I love getting some good jeans for him, especially. Value Breakdown: The retail price of all my items add up to about $264 according to the info sheet, but with the discount from keeping a full box my total is $98. That’s about $16 per item (counting the 3-piece outfit as one item)! You can always exchange free for a different size! One of the nice perks. It’s good to see the boy box! I’m on my third box order for my oldest daughter, but all three of my kids are girls. So I won’t need boxes for the younger ones since I’m stocked. But if I have a boy, then it will be nice to order some boxes for him! I like the good quality pants and nice looking shirts in this box. I really like the space/stripe top!